You know that big wedding last weekend on Beachside Avenue? The one that featured white tents on Harvey Weinstein’s property, for glampers — “glamour campers” — to shelter on Friday and Saturday night, roughing it with only wooden floors and queen beds? The one where fireworks lit up the sky after the ceremony, and a ton of security (uniformed cops, plainclothes and more) patrolled the area? Turns out it was pretty, um, glamorous. Zach Lasry — son of billionaire hedge fund owner/Milwaukee Bucks co-owner/Beachside Avenue resident Marc Lasry — married Arianna Lyons. They work together in film production. Among the guests: former President Bill Clinton, and former Senator/Secretary of State/presidential candidate Hillary Clinton. 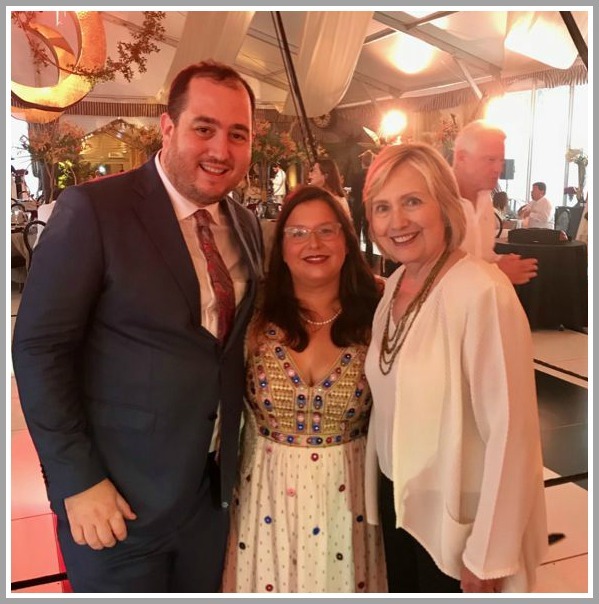 No word on whether they glamped, or decamped after the festivities to Chappaqua. 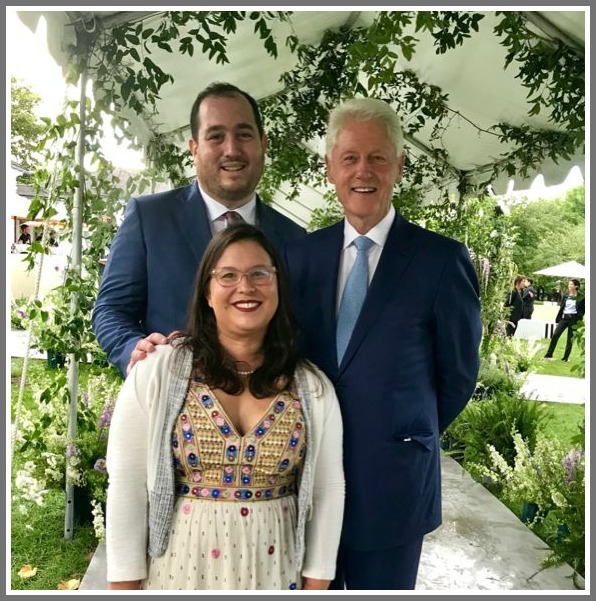 This entry was posted in People, Politics and tagged Beachside Avenue, Bill Clinton, Harvey Weinstein, Hillary Clinton, Marc Lasry, Zach Lasry. Bookmark the permalink. Tell me something, who really cares about this, and if you do, can you really tell me why? Well, it’s not every day a former president and presidential candidate come to a wedding in your town. That may be the case Dan but I wish those two would give it a rest. Maybe volunteering at a soup kitchen in Bridgeport would be more authentic. After all, there are many more homeless people than nouveau riche and their nickels and dimes would add up fast. The best thing for them would be that nickels and dimes (unlike used underwear) are difficult for the IRS to trace. Jeeze! Are they not allowed to go to weddings (of their friends kids) that they’re invited to? Last time I checked, there wasn’t a major news announcement about this, or frankly, any of the activities of their daily lives. Dan chose to write about this because it’s something that was happening in town that we all noticed; they didn’t put it out there. For all you know, they are volunteering in a soup kitchen somewhere, and that isn’t getting press either. If they were volunteering in soup kitchens, rest assured it would have been covered as the 2nd coming of Christ. Except that Christ is out of favor these days. Dan (my friend) chose to write about it, I chose to comment on it and because I disagree with you, you chose to make an issue out of it. Dan, on the other hand, doesn’t get a wedgie over diverse opinions. Not being a fan of any of those people, I was surprised how attractive they looked. The longer they are out of office, the more attractive they will look. Fun to now know the “backstory” of the glamping situation! Now, where can I snag me some Bagillionaire too?!? Cuz, I want Bill Clinton at my wedding. Every little girl’s dream! The Public Likes to know . If You are not curious don’t read the it. ‘Glamping’ is . Would never have know if Dan didn’t put in this neighborly tid bit.. I agree with you. Another chapter in Westport History which is always fascinating. Exactly! It’s not every day you see a fancy tent encampment pop up next to the town beach! It was even more impressive as you drove further down Beachside Ave and got a view from another angle! It’s fun to see how the other half live. Glamping with with Hillary. Sanctimony under the stars. “Their friends kids wedding”? Or their donors kids wedding?…My friends don’t pay me to be their friend. It’s a dilemma indeed Rich. Are there donors because they’re friends or are they their friends because they’re donors? I prefer the chicken versus the egg because its apolitical and not self-serving. Where were the #metoo protesters? ?